What Happens If I Run Out of Propane In My Tank? Propane is a natural gas that is known by consumers for its waste reduction and affordability when compared to electricity or other fuels. When used properly it is a safe natural substance. However, like all types of energy, it has the potential to be hazardous when improperly managed. A common hazard that occurs with residential homeowners is a propane tank run out. These are not ideal not only because of the inconvenience of no heat or energy to power your generator, pool heater, etc. but also due to the time, legal requirements and expenses needed. What Causes a Propane Tank Run-Out? The main cause of a propane tank run out is simply improper management. Perhaps sudden cold weather caused an unpredictable surge in your home heating, or the fuel supplier is unable to deliver due to bad road conditions or poor planning. In any case, a propane tank run out should not be taken lightly. There are many risks associated in the circumstance of an empty propane tank. A more dangerous cause of a propane tank run out is a tank leak. Propane is naturally odorless, but it has been infused with a rotten egg like odor for consumers to be aware of leaks and avoid potentially disastrous outcomes. If this is the case, immediately evacuate the location in which the leak has occurred. Refrain from using electricity or any type of spark as flammable propane has been leaked into the air and could easily cause an explosion. Why is Running Out of Propane Bad? The most obvious and noticeable effect of a propane tank run out is the inability to fuel any of your appliances or heating. In the event of an empty tank, your generator can no longer fuel any appliances. The fridge can’t stay cold, so all your food is now perishable . The heat’s not working, so both your home and showers are ice cold, and your gas stove will not light no matter how many times you try to turn the burners on. Property damage resulting from a tank run out is by far the most expensive risk associated with this. Without the fuel to keep your house warm, the pipes could freeze and burst, leading to costly repairs. pIn addition, the tank itself can be ruined if open air and moisture get inside causing rust. An empty propane tank is practically breeding ground for air and moisture to enter, causing rust build-up inside of your tank. Not only is this permanent, but also then masks the propane odor, making it more difficult to detect a leak or when something else has gone haywire with your tank. The risks associated with this are all equally as dangerous. Once you have detected the empty tank, had it checked out for leak, you need to ensure that all the valves and gas lines running to the tank are shut tight. Otherwise, when your tank is refilled, it will cause a leak which brings you back to square one. After a propane tank has run dry, you are federally required to have it checked by a qualified technician to inspect for any leaks or issues associated with the tank. The downside of this is not only does it take time to schedule a tank appointment and have it properly inspected, but also these can be quite costly with the money coming out of your pocket. Tank Leak checks can be anywhere from $50-$100 and usually differs by fuel supplier. Of course after you run out you are expected to have your propane refilled again. If this date happens to land on a weekend, not only are you going to have to rush a tank leak check, but also will have to expedite the propane delivery which is an additional cost. The most important thing to note is that the only person that should attempt to repair or manage the tank is a qualified technician with previous experience and knowledge working with propane tanks. There are many risks associated with improper management including a leak, explosion, injury or property damage. It is best to be safe and leave the responsibility to that of a qualified technician. For more safety tips, check out Propane Education & Research Council. How Can I Prevent a Tank Run Out? Walking to the location of your propane tank periodically to manually read the k-factor to ensure you have enough propane. This can be both time consuming and inefficient if there is bad weather or the dial is inaccurate. 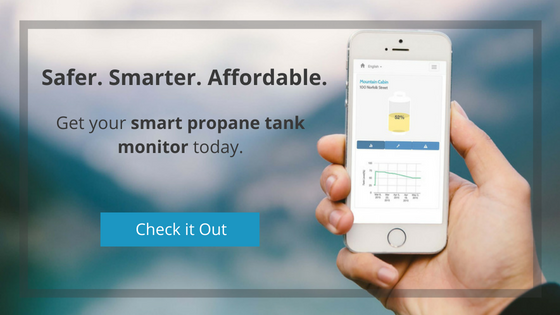 You can purchase smart propane tank monitors can connect right to your phone so you can access real-time tank level data from just about anywhere with the mobile app. It will show you trends in your usage and send you alerts when it surpasses a certain threshold. It is a fool-proof and efficient, modern way to make sure your appliances will stay running! Stay in contact with your fuel supplier. Ask them if they are monitoring your tank, what your predicted usage is, and any other questions you may have. Suggest they try out tank monitoring! 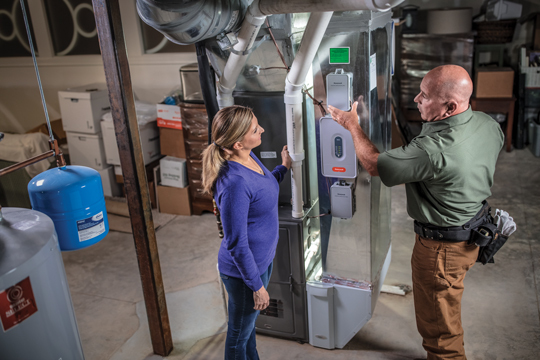 Have your propane system inspected before the beginning of the heating season. This will eliminate any hazardous risks that could be associated with it: a leak, rust build up, open valve, etc.